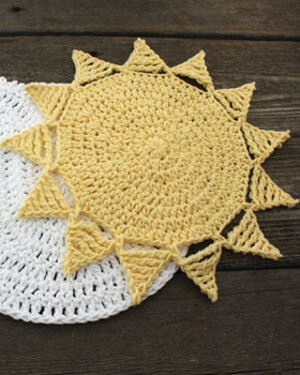 Bring colorful sunshine into you home with this Buttery Sunshine Crochet Dishcloth. This easy crochet dishcloth pattern is perfect for the summer and is a fun way to add some whimsy decor to your kitchen or bathroom. Great for beginners and advanced crocheters alike, this easy pattern is great for those who are just learning to crochet, as well as those who are just looking for something quick and easy to make. Ch 2 at beg of rnd does not count as st.
Chain 3; 1st rnd: 10 hdc in 3rd ch from hook. Join with sl st to first hdc. 10 hdc. 3rd rnd: Ch 2. *2 hdc in next hdc. 1 hdc in next hdc. Rep from * around. Join with sl st to first hdc. 30 hdc. 4th rnd: Ch 2. *2 hdc in next hdc. 1 hdc in each of next 2 hdc. Rep from * around. Join with sl st to first hdc. 40 hdc. 5th rnd: Ch 2. *2 hdc in next hdc. 1 hdc in each of next 3 hdc. Rep from * around. Join with sl st to first hdc. 50 hdc. 6th rnd: Ch 2. *2 hdc in next hdc. 1 hdc in each of next 4 hdc. Rep from * around. Join with sl st to first hdc. 60 hdc. 7th rnd: Ch 2. *2 hdc in next hdc. 1 hdc in each of next 5 hdc. Rep from * around. Join with sl st to first hdc. 70 hdc. 8th rnd: Ch 2. *(2 hdc in next hdc. 1 hdc in each of next 8 hdc) 7 times. 2 hdc in next hdc. 1 hdc in each of next 6 hdc. Join with sl st to first hdc. 9th rnd: Ch 1. 1 sc in same sp as sl st. *Ch 7. 1 sc in 2nd ch from hook. 1 hdc in next ch. 1 dc in next ch. 1 tr in next ch. 1 dtr in next ch. (Yoh) 4 times. Draw up a loop in next ch. (Yoh and draw up a loot through 2 loops on hook) 5 times – triple tr made. Miss next 5 hdc of 9th rnd. ** 1 sc in next hdc. Rep from * 11 times more, then from * to ** once. Join with sl st to first sc. Fasten off. I have not made this yet but the instructions look straightforward. The last round with the points seems easy to do since I have worked edgings like this before. I am going to make one since I always need dishcloths and I find the home made ones last longer. the reason you aren't getting any pictures of the sunshine dish cloth is because no one can figure out how to make the "points" on the round dish cloth. I sure need better instructions, maybe everyone else does too. Hi! The points are made in the 9th round. You're going to chain 1 then single crochet in that same slip stitch from the previous round. Then chain 7 and single crochet in the second chain from the hook (working down the chain 7). Then in the following stitch, you're going to do a half-double crochet, then 1 double crochet in the chain after that, and one triple crochet in the chain after that, then one double treble crochet in the next chain (here's a description on how to do that: https://www.lionbrand.com/faq/230.html?language=). Then you're going to yarn over your hook 4x and insert your hook into the next stitch and draw up a loop. Then yarn over and pull through 2 loops on your hook 5 x. Skip the next 5 half double crochets and work 1 single crochet into the next half double crochet, then repeat the whole thing from the Chain 7. I hope that helps! If you need more information, you can always contact the company, Lily Sugar'n Cream, for a diagram or maybe a video. Thanks! can't figure this one out--can't figure how to do the points on the circle, is there a video or better instructions ?